If you want to know how to make the best salted caramel, in my opinion you should look no further than chocolatier Paul A Young’s recipe. A couple of years ago I interviewed Paul for The Artful Diner and he sent me home with a box of his chocolates. The memory of those chocolates stayed with me and come Easter I found myself strolling past his new store on London’s Wardour Street. Much like a small child with her nose pressed against the glass, I spied his latest creation, an egg, a little larger than a duck egg, made with a chocolate shell and filled with salted caramel. Vintage knife and Victorian food cover with glass beads by Sew&Sew in Cornwall. Again like a little child, I pestered D for one, he took the not-so-subtle hint and a few weeks later I was sat at my parents’ table in Cornwall, chocolate salted caramel egg well and truly in hand. I searched online to see if I could find his recipe and had no luck, until recently when I found his recipe for Simnel ‘spiced’ salted caramel. I had a go at making it minus all the spice and with the use of clotted cream in place of double (I was in Cornwall). Part of what makes this particular salted caramel so special is the use of milk chocolate stirred through at the end. I would also caution that you should use sea salt flakes which have been crushed, rather than rock salt or larger lumps of sea salt. This will give you a perfect tinge of saltiness. How strange and how delicious that we’ve all become so obsessed with it. In case you’re wondering where I found the props in my pictures, I tried out this recipe at home in Cornwall where my cousin Amanda runs a vintage fabric business. It’s called Sew&Sew and is full of beautiful, original bits and bobs. You can buy all the fabrics and props I used: the vintage knife and linen tray cloth as well as the Victorian food cover with yellow glass beads. If you happen to be in or near north Cornwall you can see and buy some of Amanda’s vintage fabrics and kitchenalia at 2 Quay Street, Lostwithiel. I have tweaked Paul’s Simnel spiced salted caramel by removing the spices and using clotted cream instead of double. Put the butter, sugars and salt into a small pan on the hob and bring to a gentle simmer as you stir. Keep the heat quite low otherwise it will catch before the sugar crystals melt. Bubble for eight minutes, again on a low heat. After the eight minutes are up, take the pan off the heat and add the clotted cream, whisking all the while. It may splutter, but keep calm and keep whisking – it will come together. 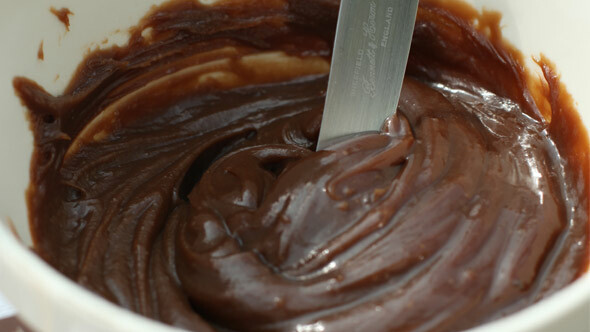 Now add the milk chocolate squares and beat until they have melted in. 10 Sep	This entry was published on September 10, 2013 at 9:09 pm. It’s filed under Dessert, Gluten free, Recipes and tagged Baking, caramel, chocolate, dessert, Food, milk chocolate, Paul A Young, recipe, salted caramel, sugar, wheat free. Bookmark the permalink. Follow any comments here with the RSS feed for this post.